I know I promised this tutorial a couple of weeks ago but life got a little hectic. Besides being a wife, mother to 3 kids, a full time home executive (SAHM), Cub Scout den leader and a small business owner, I have decided to add another title to my busy life. The new title is “student.” It has been almost 10 years since I left college as a Junior with only one year left towards obtaining my degree. I have now enrolled in my university’s independent study bachelor’s program. That is why I have been sparse on the blog posting. I found myself with a little free time while I wait for my final exam of my first class (of 17 left) to make it’s way to my proctor. So I thought I would make good on my promise of a tutorial. If I go missing again in a few months, you’ll know it’s because I’m trying to finish up a class before the deadline! 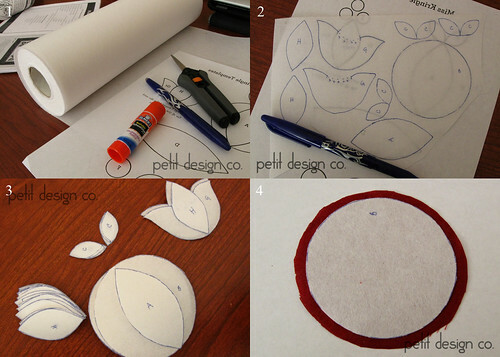 In part one of this tutorial we are going to cover the process of getting your shapes ready for sewing. Everything on the picture at the beginning of this post (the cardinal block) was done with this method with the exception of the stems, those are embroidered. You can see that with a little bit of practice you can do pointy, curvy and small shapes with this method. I did have some trouble with tiny circles (1/2” or less) with this method and making their edges smooth. I am going to try a different method for those. Oh and in case you are wondering were the beautiful cardinal block came from, it is part of the “Jingle BOM” by Erin Russek and it is available for free through the end of 2013. These are the items I prefer to use and am familiar with. I do NOT have experience with other brands but I know that other brands are available. The main item you need is the wash-away embroidery stabilizer. You can find the Floriani rolls online for about $15 +shipping and they are 12”x10yards. This is pretty economical and one roll should last a very long time. The stabilizer I use is like a thick and stiff paper towel. I can easily see through it to trace my pattern. It is stiff enough to help me turn over my fabric, but it must be handled with care because you can fold/bend it out of shape. The fusible is left in your quilts and over time through regular washings the fusible will soften and dissolve like paper. The fibers will still be between your fabrics but they will be soft and end up looking like a used dryer sheet. I do not think that the “fusible” part is necessary. When I started using this product I found that the fusible was very weak. I followed the instructions but it could be that my iron was never at the right setting. Too hot and you melt the glue beyond it’s effectiveness. Too cold and the glue will not activate. It could have also been that I don’t pre-wash my fabrics and the sizing on the fabric may interfere with the adhesive. I have found that I can achieve this method of embroidery with minimal use of my iron and thus keeping my fingers free from burns and hot fabric. 2. To begin you trace as many pattern pieces as you’d like to begin with. I usually cut about a 9” section off the roll to begin with and fill it up with as many shapes as possible. Don’t forget to reverse/mirror your pattern when you print it. Oh yeah, the Floriani fusible has a shiny side (that’s the adhesive), make sure you are tracing on the non-shiny side. Trace your shapes carefully and as perfectly as possible. Make sure to label your shapes so you know where they go and to mark any sections that will tuck under another shapes so that you don’t waste time turning under those edges. 3. Now cut your shapes out, again being as careful and perfect as possible. I love my spring loaded scissors for this step because they do not tire my hands out. Whether using regular scissors or spring loaded scissors I have a few tips on cutting. I find that I get the smoothest cuts if I never cut by closing the scissors all the way. I usually close the scissors about 3/4 of the way. The other thing I do is to move the object I am cutting rather than my scissors. 98% of the time I keep my hand with the scissors still and as I cut I use my other hand to move the paper under the scissor. I know it may seem counter intuitive but give it a try and let me know how it goes! 4. Now take a shape and fuse it to the back/wrong side of your fabric. Or if you want to be like me, just use your purple friend and swipe it a few times across the stabilizer and slap it on the fabric. Don’t go crazy with the glue, you don’t want blobs of it on your quilt because it will gum up your needle. If your glue is blobby you can throw it in the freezer for a few minutes. It also helps to clean it off once in a while on a piece of scratch paper, get all the blobs off on the paper to get to a fresh layer of glue. If that doesn’t help pop open a fresh stick and give the old one to your glitter loving 6 year old. Once you have your shape glued down cut off the excess fabric leaving a 1/4” seam all the way around. Now comes the slightly tricky part. I don’t use any special tools for these steps, just my fingers and nails. For the remaining steps I like to use a piece of junk mail that is shiny as a mat, such as a magazine or postcard mailers. The shiny finish keeps your fabric from sticking to the page even if there is a bit of glue there. 5. Pick a place to start on your shape. I don’t usually clip my curves unless the fabric is misbehaving. 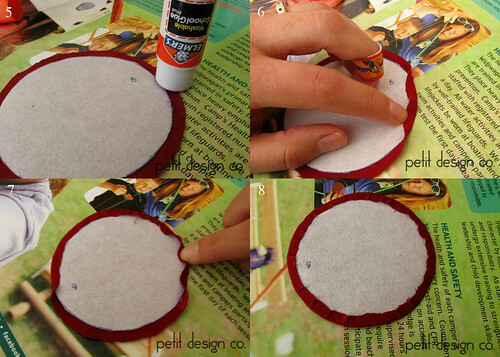 Add a little glue to the edge of the fabric and gently ease the fabric over. I usually leave the piece I’m working on right on the “mat” as I work. If you find that you have better control by picking it up then go ahead. 6. 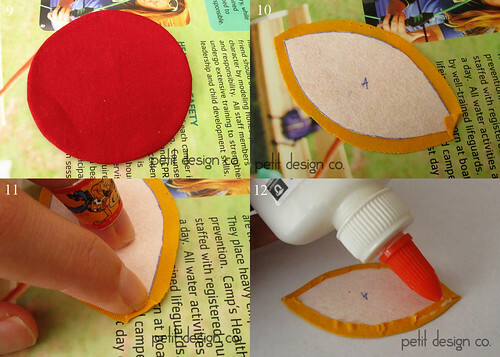 Apply glue to a small section of fabric right next to where you started. I usually work in 1”-1.5” sections. Then, rather than folding over the fabric right next to the section you just finished, start to roll the fabric over about a 1/2” from the spot I previously finished. Then I back track to the previous spot, folding over the fabric as I go. For some reason this allows me to better ease the fabric around the curve and makes a smooth curve rather than one with little points. 7. This step shows a clearer picture of what I was trying to explain in step 6. At this point in the picture I have already applied glue to a 2” section (you can see the purple above the last “t” in petit.) You can also see that I had previously stopped right at the arm of the lady in the magazine. After I applied the glue I folded over the the spot to the right of my finger (notice I didn’t fold over right where my glue ends.) Then I moved counter clockwise about 1/4” and folded over the spot right under my finger. The next step would be to go back and ease over the spots that are sticking up directly to the right and left of my finger. Continue in this manner until you have folded over the fabric around your entire shape. The nice thing about using glue is that you can gently pull the fabric up if you need to reposition and try again. You have to be careful to not distort the stabilizer as you are folding your fabric over. It is stiff but you can still bend it out of shape. Start with your large, less curvy shapes until you get the hang of it. 8. Here is my finished shape. 9. Here is the front side of the shape. You can see that it is nice and smooth with no angles. 10. If you are doing a shape with a point you can start by folding the point over first and taking it down with your purple friend. 11. To get a nice crisp point I like to place my finger nail right along the stabilizer on top of the folded point. I keep it there as I fold over the fabric to maintain the point. This helps to keep from bending the stabilizer out of shape. You could also use an acrylic or bamboo cuticle stick instead of your nail. I like to use my nail because it is one less tool to keep track of and I know where it is at all times! 12. Once I am ready to put my shapes on my background fabric (or to layer a more complex shape) I run a super tiny bead of regular Elmer’s washable school glue along the seam allowance. I then flip it over into position and heat set it with my iron. The iron dries the glue and it stays put until you wash it out or pull it off the fabric. At this point you could either hand stitch it down or machine stitch it down. In the next part I will show you how I stitch my pieces down. Great tute! Thank you. How exciting to go back to school....enjoy. Thank-you for the time you put into this tutorial, it means a lot to people like me who do not like the burns on my fingers from the starch method and want to achieve perfection. You are so kind and giving. Good luck on your studies. Hi Norma. I found you while looking at the Jingle Belles Flickr group. I love your method of applique and I have used it myself. I appreciate the detail of your tutorial. I'm in the middle of one for fusible machine applique and there's a lot that goes into it! So thank you! 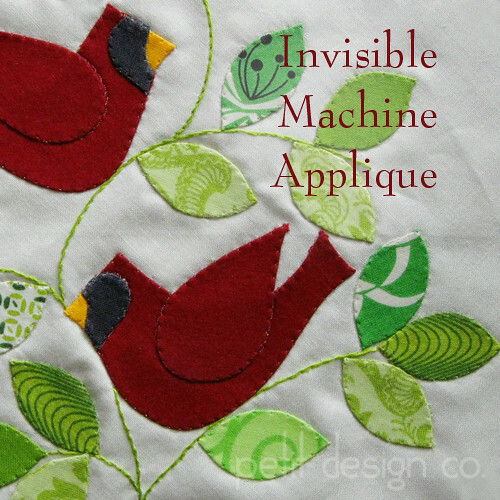 Great tutorial for one of my main quilting goals; applique. I found your blog from a google search that turned up your 31 Days Of Walking Foot Quilting. Thank You for that!